We'll need to inherit from the default controller factory. Mainly so we don't have to re-invent the wheel and we can just override one part of it. For the purposes of this demo we'll need to create an example service and interface, to demo the Ioc process and ninject. 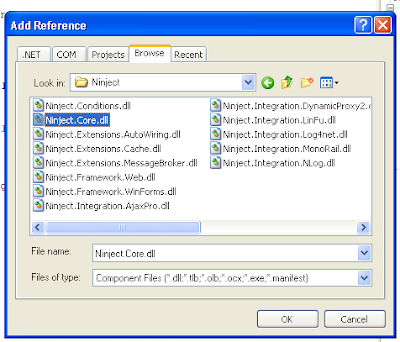 Now we can setup a ninject Module which returns our ExampleConcreteClass when given the IExampleInterface. Finally we'll override the GetControllerInstance Method from the DefaultControllerFactory using ninject to return a controller complete with any parameters in the controllers constructor. // We don't want to pass null to ninject as we'll get a strange error. 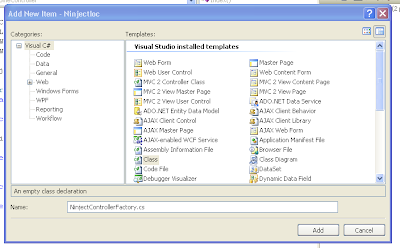 Now we'll need to tell the MVC 2 framework to use our new Controller Factory insted of the defaultControllerFactory. // Setup Our new Controller Factory. That's it for the setup. Now we'll need to test it out. Now if this work's we should see the word's "Hello World" on the home page. I'm not able to download a copy of your example, can you check that your link is good please ? Great post, still cannot get why "Type controllerType" may be null?